Human breast carcinoma tissue. Extracts from MCF7 cells. Our Abpromise guarantee covers the use of ab47435 in the following tested applications. WB 1/500 - 1/1000. Detects a band of approximately 132 kDa (predicted molecular weight: 132 kDa). Expressed at higher levels in primary colon tumors than in normal colon tissue. 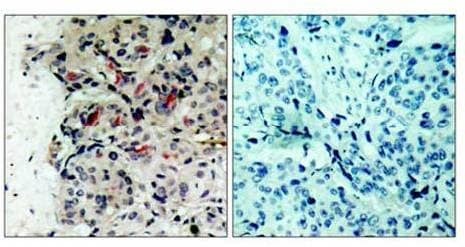 The expression level in metastatic colon tumors is comparable to the expression level in normal colon tissue. Possesses two phosphotransferase domains. The second one probably contains the catalytic domain (By similarity), while the presence of slight differences suggest a different role for domain 1. 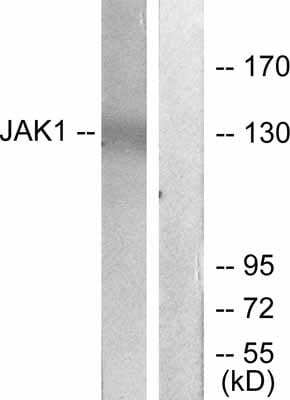 The FERM domain mediates interaction with JAKMIP1. Endomembrane system. Wholly intracellular, possibly membrane associated. 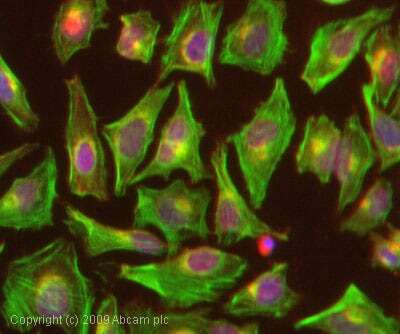 ICC/IF image of ab47435 stained HeLa cells. The cells were 4% PFA fixed (10 min) and then incubated in 1%BSA / 10% normal goat serum / 0.3M glycine in 0.1% PBS-Tween for 1h to permeabilise the cells and block non-specific protein-protein interactions. The cells were then incubated with the antibody (ab47435, 1µg/ml) overnight at +4°C. The secondary antibody (green) was Alexa Fluor® 488 goat anti-rabbit IgG (H+L) used at a 1/1000 dilution for 1h. Alexa Fluor® 594 WGA was used to label plasma membranes (red) at a 1/200 dilution for 1h. DAPI was used to stain the cell nuclei (blue) at a concentration of 1.43µM. Publishing research using ab47435? Please let us know so that we can cite the reference in this datasheet.